Getting you the latest updates on fashion trends is our priority. The Aso ebi styles we have sourced just for you are simply chic and fabulous. Being on top of your Aso ebi game is top priority if you are about to storm that Owambe, you have to check out these styles and have your tailor/designer on standby if you want to stand out beautifully in any occasion you choose to address. There is always one occasion to attend for most of us, the Aso ebi is a trend that follows every occasion not just wedding ceremonies alone which is most common, but other events too i.e child dedication, thanks giving, burial ceremonies and the list continues. The Aso ebi is a tradition for us Nigerians and it has been for a long time I don’t think I have been to any occasion without the Aso-ebi being involved. The Aso ebi has been linked to the Yoruba culture hence the name “ASO EBI” which basically means “Family – Cloth” but according to some historians, it has been in existence in some other tribes long before now. Well whether or not it has been in existence is a topic for another day because right now even those tribes that didn’t understand the concept are now party to this tradition. So it’s safe to say it has spread widely across the Nation and it isn’t just associated to the Yoruba’s anymore but other ethnic groups who have joined in the culture. Even Nigerians in Diaspora still very much keep up with this trend. There are so many styles that you can sew as Aso Ebi whatever the occasion may be, if you want to keep it simple and chic, dramatic, however you like, we got you. You can also get inspiration from these styles and create styles of your own. They are so many accessories or embellishments that can be used for Aso ebi styles to enhance the look of the fabric, you can use studs, fur, beads etcetera. You will definitely want to be seen in these designs we have sourced just for you they are classy , elegant and stunning. What other way to make a fashion statement than rocking the flared “design” trouser, Also know as the wide leg trouser or bell bottoms or Ankara Cigar Pants. Be fashion forward with this fashion trend that is effortlessly gorgeous. The flared design has been since the 70s, it’s a big hit; this trend is back in the fashion scene and it an absolute Yes! When it comes to being fashion forward do not hold back, if you are comfortable in your skin you’ll be comfortable in whatever you put on. The Cigar pants give a sense of freedom when worn, it is fun and this is because of its distinct design, it is tight from the waist and hips and flares out when past the calf. If you’ve been putting on straight cut trousers and pencil trousers it is time to switch it up and let the air flow through your legs by wearing the bell bottoms trouser. This style goes brilliantly well with all sorts of fabric like i.e Ankara, velvet, jeans etc. You will fall in love completely with this style. The flared trouser can be combined also with all sorts of upper clothing’s, styled the right way you can never go wrong with this design. Some people don’t get it right even as it is one of the simplest piece of clothing to put together, the fit is also very important it has to fit perfectly to bring out a flattering look. Discover the beauty of the flared design and spice up your wardrobe with this style. If you don’t have a pair grab one immediately and be a part of the fabulous trend. Keeping up with fashion these days are a must, as the fashion stakes are just getting higher and higher. Thank goodness to Instagram and fashionistas for entertaining us with lit and stunning styles everyday. Most times due to last mins notices, we tend to just sew style we might not likely wear again, which is why we take pride in our job of feeding you with the latest and lit styles for your owmabe parties. 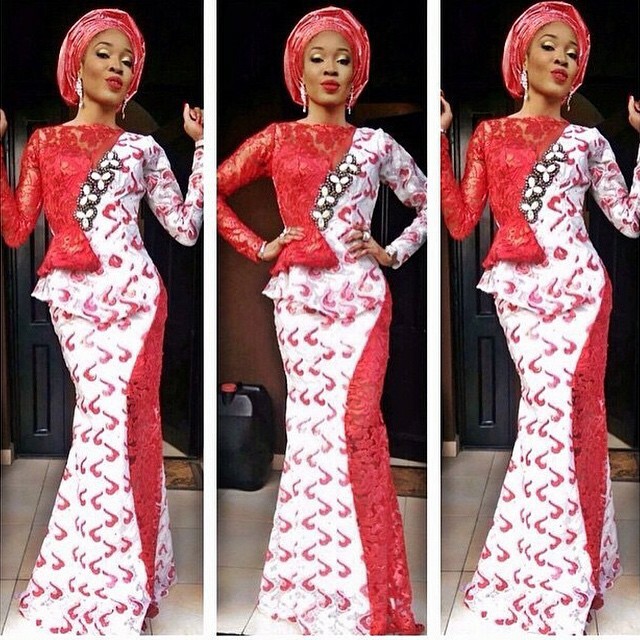 The set of aso ebi styles we have gathered are a must see, they are fierce and they are fabulous. If you are confused and you do not know how your Aso ebi styles should be/ look like, then allow this creative styles stare up your creativity. These styles are created to capture and reveal your youthfulness and cause you to illuminate wherever you walk in, they are trendy styles that’ll bring out the best in every woman. Yes, you can achieve this flawless look in just 20 minutes! Sisi Yemmie shows us in this ‘Owanbe’ Aso-Ebi look how you can get ready for any occasion in less than 30 minutes. Kate Henshaw makes champagne gold, gold, and custard yellow a good color combination as she struts her slim enviable figure in this stylish Aso-Ebi style. Kate Henshaw Sizzles in Trendy Aso-Ebi Style was last modified: May 4th, 2017 . While fashion promotes unity, it also gives way for individuality all you need to do is find out how best your individuality can work to your own advantage. Fashion in Nigeria basically comprises of the aso ebi and the Ankara fashion which is majorly for uniformity, but in other to stand out you must do something different with what you have been given. If you have an upcoming wedding, the first question that comes to mind is what to wear to a wedding. 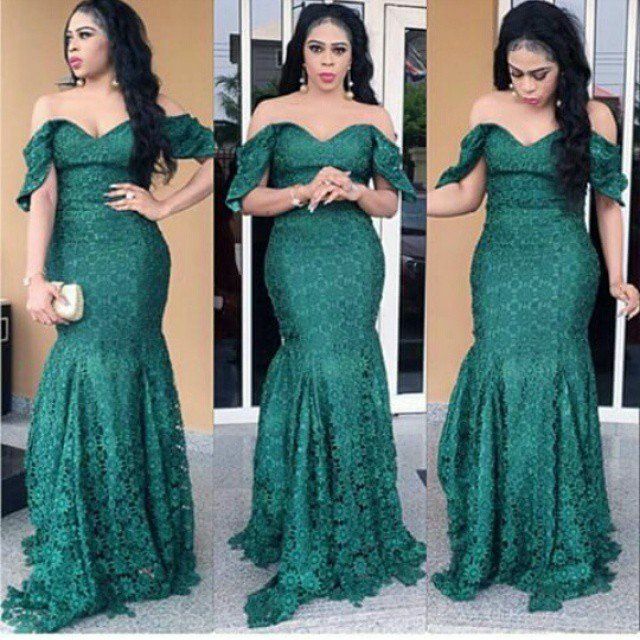 The choice of the outfit that you are going to wear in a wedding counts a lot and you cannot afford to look shabbily dressed when it comes to a wedding. Having the right kind of dress sense is essential. When you are a guest at a wedding, you may be confused over what to wear to a wedding and this thought may actually bug you for days before the wedding day. Make a bold fashion statement with your Aso-Ebi styles.